This one is true rarity. 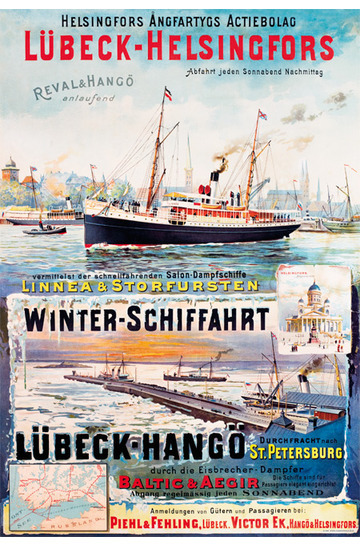 It is a poster for the Finnish shipping company Helsingfors Ångfartygs Aktiebolags and their route to Germany. The original dates back to around 1890 and as far as we know there is only one copy saved to the afterworld. And we have that very one! 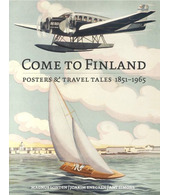 This should by the way be the second oldest graphic Finnish travel poster done. Note that the wintertime harbour in Finland is Hangö (Hanko), this because of the much better ice situation over there. The normal route was Helsinki-Hangö-Reval (Tallinn)-Lübeck. The company Helsingfors Ångfartygs Actiebolag (HÅA) (the Helsinki Steam-engine Limited Company) never had it easy: On its maiden voyage in 1869 to Lübeck the com-pany’s first cargo ship Helsingfors ran aground outside Öland. Six years later the legendary vessel Storfursten was introduced to the route. She could take a total of 38 (!) passengers and with her luxurious salons she was the queen of the Helsinki harbour. However, eight years later the Austrian Nina drove straight into Storfursten outside Öland. Then, in 1905 Helsingfors sank after a violent grounding, six people drowned and an economic catastrophe was a reality – again. The following year Storfursten also sank. 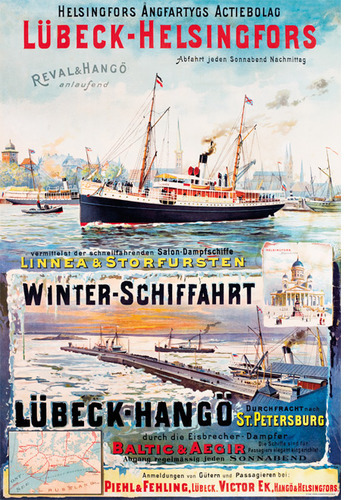 The setbacks continued: When Germany declared war against Russia on the first of August 1914, the Germans took ownership of two of the company’s vessels that happened to be within German territory, whilst the Russian authorities acquired the other two HÅA vessels through a compulsory purchase. During the Finnish Civil War in 1917, communist red guards boarded Aegir in order to flee to Russia – and naturally ran aground in the Gulf of Finland. Three years later the destitute HÅA was merged with the powerful Finska Ångfartygs Aktiebolag (FÅA, which would become Silja Line a long time after, today Tallink Silja). We want to salute these pioneers: They never gave up! The artist for this artwork is unknown. But we continuously seek more information about all posters and images in our product range, so please write us if you think you know something interesting about this image! Write to posters@cometofinland.fi The Poster Hunters say thank you!